DC’s classic Silver Age hero is revived in CAVE CARSON HAS A CYBERNETIC EYE VOL. 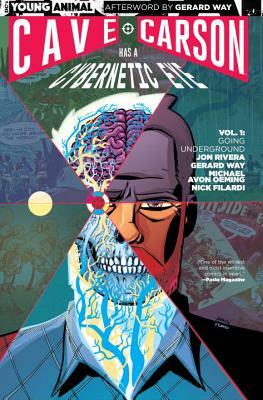 1: GOING UNDERGROUND, the first chapter of a trailblazing new saga from artist Michael Avon Oeming (Powers) and writers Jonathan Rivera and My Chemical Romance’s Gerard Way, the visionary founder of DC’s Young Animal imprint! Cave Carson was once the world’s greatest underground adventurer—but that was a long time ago. When he settled down with his wife, Eileen, to raise their daughter, Chloe, he traded the controls of his vehicle, the Mighty Mole Mark 1, for a desk and keyboard. Since then, Cave has led a quiet life—even with the constant distraction of his otherworldly cybernetic eye. But when a sudden illness claims Eileen’s life, Cave’s tranquil existence is shattered—and he and Chloe soon find themselves hurtling down a terrifying tunnel of danger, discovery, mayhem and madness. At the bottom of that tunnel lie secrets buried for decades—secrets that hold the key to thwarting a conspiracy that threatens to consume the surface and subterranean worlds alike. But will Cave and his intrepid team of super-spelunkers be able to overcome this new generation of evil—or is there less to this hero than meets the eye? Collects issues #1-6. Gerard Way is the Eisner Award-winning writer of The Umbrella Academy and the comics miniseries The True Lives of the Fabulous Killjoys. He is the creative mind behind the new grassroots imprint, DC's Young Animal, whose retro-inspired lineup bridges the gap between the DC Universe and Vertigo. Way is also widely known for his former role as the lead vocalist and co-founder of the alternative rock band My Chemical Romance.